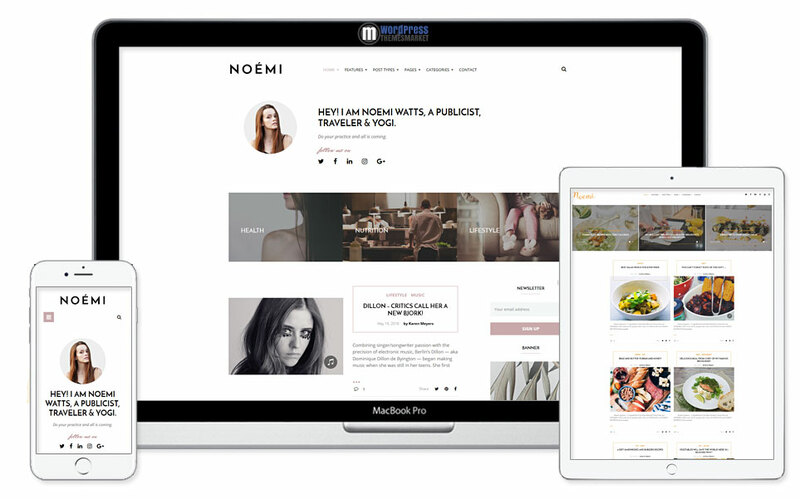 Noemi is a modern and fast-loading, pure and simple, clean and responsive, resourceful and easy to use ultimate niche Lifestyle & Fashion Blog WordPress Theme that is perfectly-suited for all fans of beautiful design and flexible functionality. This theme comes with lots of features like 10+ blog layouts, posts layouts, tons of header options, 2 footer options, 600+ google fonts, RTL support, custom color scheme, ease to install and much much more. 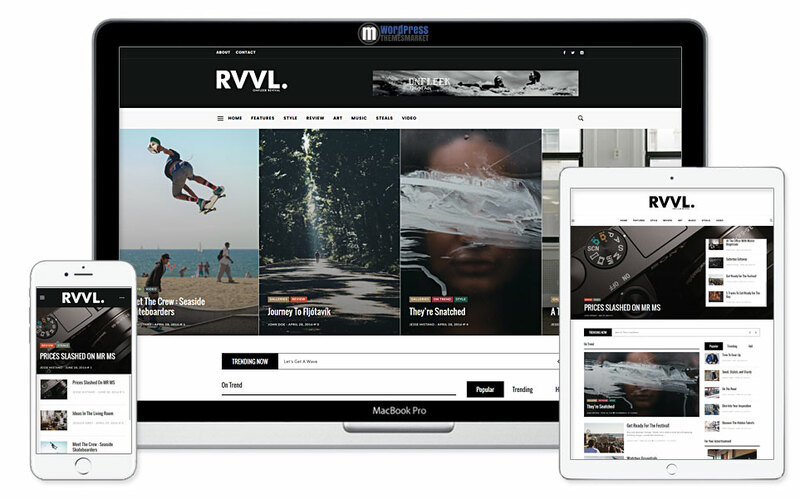 Beautifully crafted Onfleek AMP Ready and Responsive Magazine Theme is a WordPress Theme that is fast, and easy-to-use focused on flexible, dynamic and culture that explores your interests without any boundaries. It gives you 3 columns, compatibility with the most browsers (e.g. IE10+), Accelerated Mobile Pages (AMP) Support Out of the Box, simple theme options, easy one-click demo install, built-in mailchimb plugin, multiple advertising area, unlimited colors, sidebars, 8 header styles and much much more! Also, it includes well-known premium page builder plugin Visual Composer. So, do you want to have your blog looking awesome? Onfleek WordPress Theme is for you! 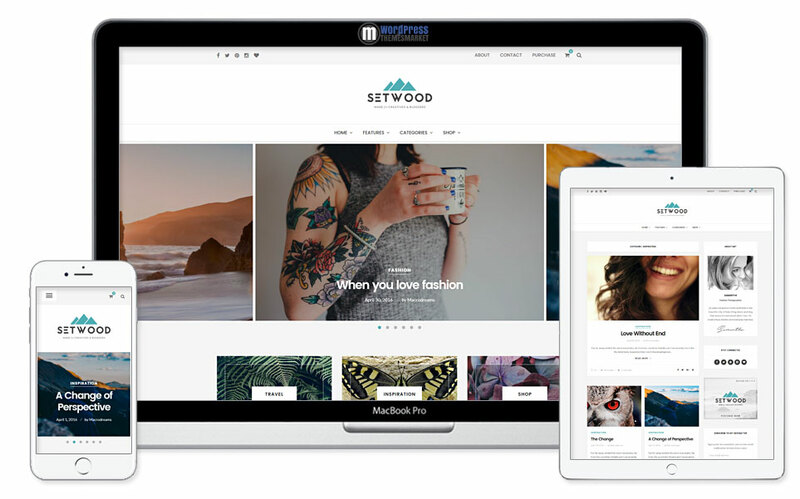 Beautifull Setwood the WordPress Blog and Shop Theme is strongly focused on lifestyle blogs, travel blogs, food blogs, craft, tech, creative, photography and also contains outstanding features and intuitive user interface. 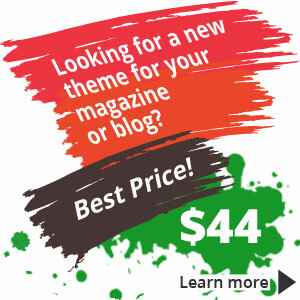 This theme is perfect choice for the loving creative bloggers. This theme is optimized for speed and performance, developed for SEO, WooCommerce integration, customizations, post formats supported, 700+ google fonts, unlimited colors, VIP support, 4 responsive featured sliders, 3 useful promo blocks below slider, RTL ready and much much more! 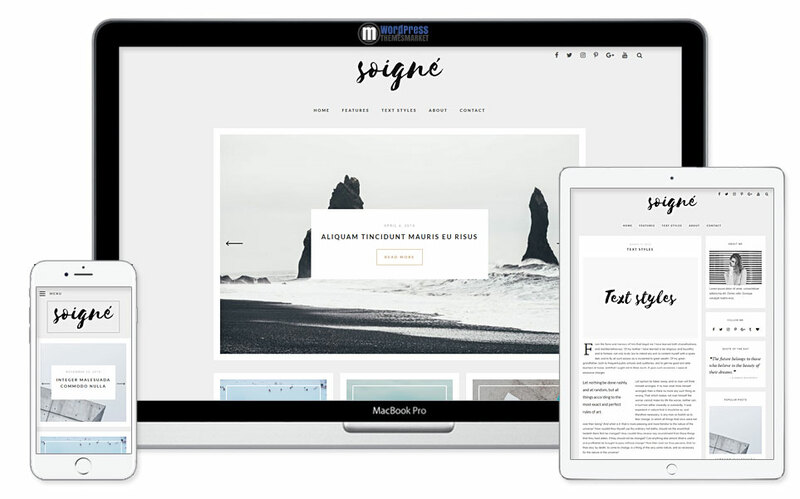 Soigne is a visually stunning, innovative, highly responsive, premium Responsive Minimal WordPress Blog Theme that was specially crafted for bloggers who seek functionality and minimal aesthetics. This theme comes with tons of features like 10+ homepage layouts, posts formats, single post layouts, custom widgets, responsive design, WPML ready, fully customisable on WP Customizer and much much more! 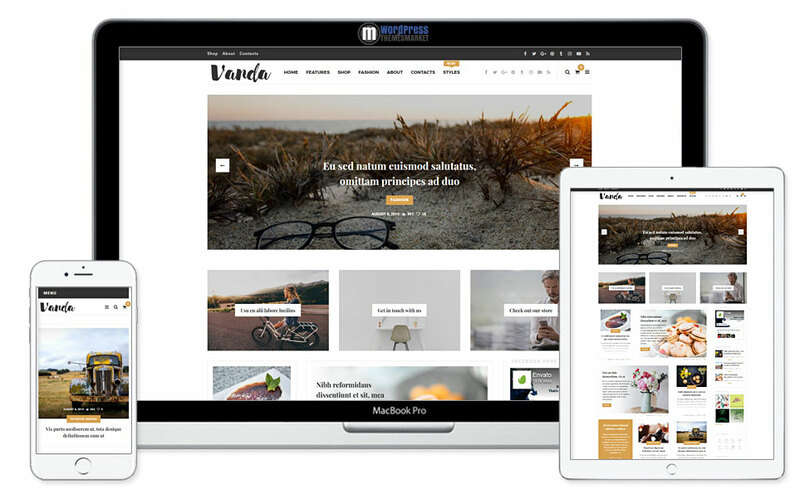 Vanda is a sleek and modern, clean and minimalistic, robust and well-designed, aesthetic and fully customizable Creative and Magazine WordPress Theme that is primary focused on publishing with a style. This theme is packed with tons of features like recipes ready, beautifully crafted 4+ posts styles, featured + unique sliders, fully customizable options, custom typography based on google fonts, 6+ header styles, responsive design and much much more! 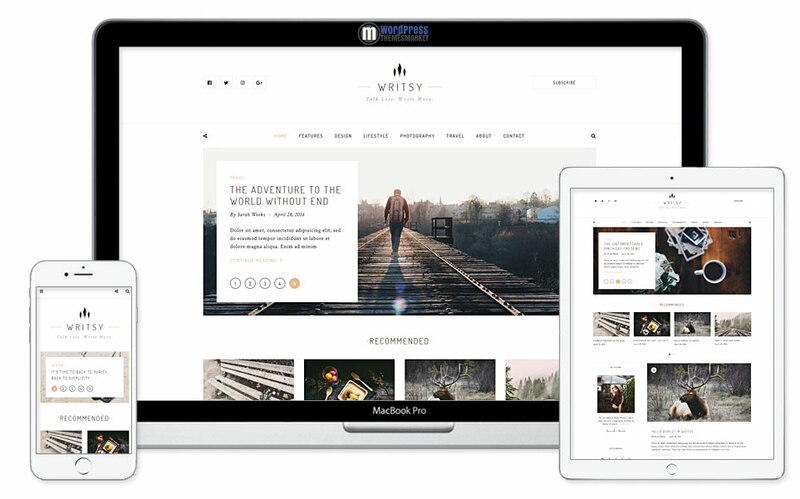 Writsy is a powerfully pliable and beautifully graphically designed, technologically resourcefull, fast and elegant Clean & Faded Vintage WordPress Blog Theme that is perfectly suited for wide-range of blog niches like blog, fashion, photography, travel and others. It comes with fully responsive layout, 24 homepage variations, 3 blog layouts, 6 post formats, 4 custom widgets, footer instagram gallery, PSD files included, WP multisite support, google fonts and much more! 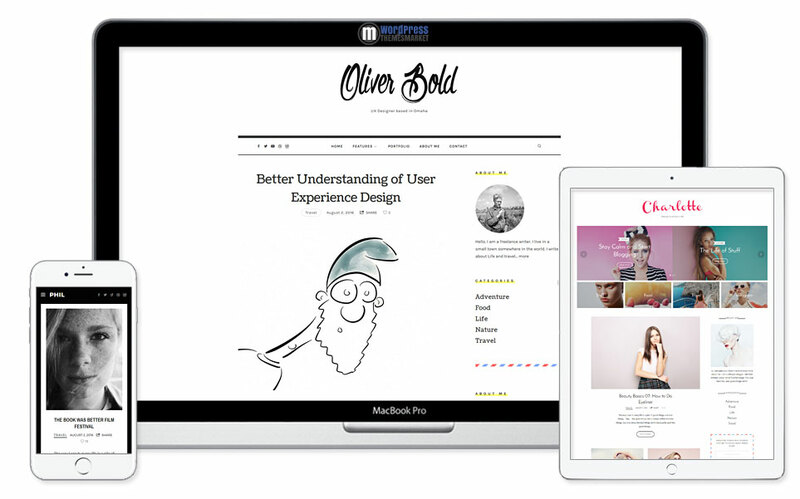 An extremely highly customizable GDN Magazine Theme for WordPress is designed for publishers and created for readers. You will get extremely powerful tool and 13 UNIQUE Demos that will blow your and your customers mind! Theme for WordPress was developed by JaW Templates based on 9 years of experience in development and managing web sites for their clients. This theme has a UNIQUE features that are easy to use and give you extremely customizations. One of these unique feature is called Color Schemes that allows you assign color presets to each corner of your page (single post, page, sidebar, gallery and others). Another unique feature is called MyNews that allows you to specify your interests, browsing your reading and follow discussions and authors. Another unique features are category and single post presets that allow you to assign these presets to every category and single post. You can simply customizate everything! With this GDN Magazine Theme for WordPress you get 4+ columns, WPML ready, budyPress and bbPress compatibility, compatibility with all browsers including IE 9+. Also, this theme containes its own page builder called Revo Composer II. Do not worry, this theme is also compatible with well-known page builder Visual Composer. I highly recommend this theme as a WordPress premium theme developer for its highly custmoizations, custom developers hook and filters, clean and fantastic code with good organized structure. I simply LOVE this theme! TheBlogger is a clean and flexible, innovative and complete, elegant, simply, minimal and responsive shape-shifter WordPress Blogging Theme for Bloggers focused on design Uniqueness. You get 4+ columns, most browsers compatibility (IE10+), 10+ unique beautifully crafted designs, looks awesome on mobiles, header layouts, featured area and much much more. This theme includes well-known premium plugins such as Easy Social Share Button and Popup Plugin for WP ConvertPlug. 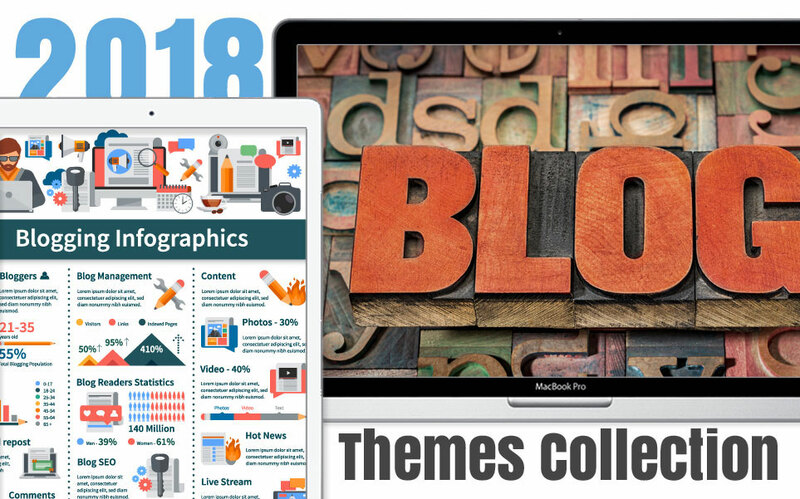 In this Best WordPress Theme Collection you will find unique, modern, elegant, flexible, tech-savvy Magazine and Blog WordPress Themes that were designed especially for bloggers and are perfectly-suited for writters. This article is very informative and insightful. I really want to thank you for this. I would like to suggest one more theme that is Bloggers Lite which is very good blog theme. I have used it for my client’s website.I hope it helps you.